Premye Etap Avèk Yon Òdinatè (First Step With Computers) / Publisher: Eastern Digital Resources, In today's competitive business environment, knowledge of computers can be one of your greatest assets. 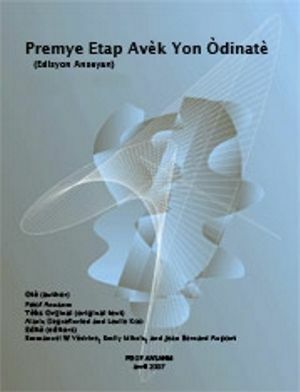 Pwof Ansanm (www.pwofansanm.org) presents Premye Etap Avèk Yon Òdinatè (First Step With Computers), the first Computer Training Manual in the Haitian Language. Appendices include a glossary of Computer terms in Kreyòl and English and an extensive list of sites on the Internet with Haitian news and educational resources. Premye Etap Avèk Yon Òdinatè is the result of teamwork, the voluntary contributions of Haitian and American educators, in development for 8 years. Final editing was done by Emmanuel Vedrine, Emily Miksic, and Jean Aupont following field testing in Jeremie, Haiti as part of the teacher training course provided by Pwof Ansanm. Purchase orders from schools and libraries are welcome. Contact us for pricing, availability, and shipping in Haiti. Contact Us at sales@ngohaiti.com or call (803) 439-2938, Eastern Digital Resources PO Box 1451 Clearwater, SC 29822-1451. For your tax deductable donation of $10 you will receive one manual and we will provide two manuals to training programs in Haiti. PLUS FREE SHIPPING! in the U.S.A.